Learn how you can participate in our efforts to walk the walk this festival season. Have you heard of Plastic Free July? It’s a thing. We’re proud that our talent and staff at Wanderlust Squaw Valley will be participating by ditching disposable utensils, bags, and straws with our custom Wander Without Waste kit. Get yours on site at a festival this summer! I thought that seeing Bob Dylan—the self-proclaimed poet laureate of rock and roll—would be the pinnacle of my concert-going life. The fact that I was seeing him perform at Bethel Woods, New York—where the original Woodstock Festival was held—well, that pretty much just put expectation over the top. For a girl who grew up listening to him on vinyl in the basement of her Ohio home, seeing him play where it all began was an opportunity to bask in the peace-loving, Earth-protecting, hippie glory of cross-generational music appreciation. What I got instead was serious disenchantment and disappointment. Dylan was fine—great, even. But as it started to drizzle and folks began to pack up and leave, my boyfriend and I found ourselves drifting in a sea of plastic. Plastic bottles. Plastic forks from waylaid picnics. Plastic wrappers. Plastic straws. Plastic everywhere, despite the ample recycling bins at all exits. We’ve all be there: At an event in which mindful practices or belief systems are touted (whether overtly, like Burning Man, or quietly, like a Bob Dylan concert) and then not respected. It’s disjointing and disheartening. After all, if attendees to a mindful event can’t be environmentally responsible, how can we expect anyone else to be? So what can you do this year to help us do right by Mother Earth? Let us count the ways. 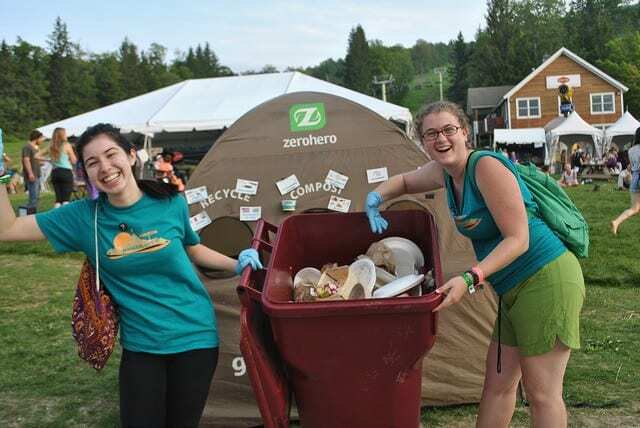 We diverted 70 percent of ALL waste generated at our events in 2017. Let that sink in! Less than one-third of all waste generated at our events—attended by more than 100,000 people in North America alone—ended up in landfills. This is made possible by our commitment to three stream recycling. We provide compost, recycling, and landfill disposal at all festivals and 108s, pending site availability. You don’t need to worry too much about mis-sorting your utensils, though: Starting for the 2018 season, we require that all food vendors use compostable service-ware. You also won’t find any plastic straws anywhere on-site—we offer only paper or recyclable straws so you can sip in good conscience. Whatever you choose to put into your body, let it be chosen with care. If you choose to eat meat, consider how it’s raised, and the environmental impact raising animals can have. While we serve meat at our events, we give priority to vegan and vegetarian vendors. Our exclusive Wanderbowl—served at all events—is available in both vegan and vegetarian options. (We’re proud to announce that at Wanderlust Snowshoe this year, all vegetables used to make the Wanderbowl are sourced from a local farm co-op!) Want more farm-to-table? Join your fellow yogis at our farm-to-table dinner at any of our summer festivals. What we eat isn’t the only mindful decision we can make when it comes to doing right by the planet—we also have the opportunity to make intentional choices when it comes to the clothes we buy and the products we use. 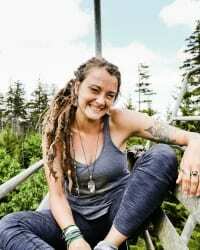 Wanderlust private label apparel items are made with either organic threads, recycled polyester, or a blend of the two. They are dyed and printed with vegan, water-based colors. All products are made and produced in LA, with the actual production cycle of these items happening in a 10 mile radius from start to finish. Our 2018 adidas x Wanderlust spring line is made in part with Parley Ocean Plastic™ upcycled materials. Getting to Wanderlust is a great way to start getting involved! Take this opportunity to carpool with a friend, or take advantage of proprietary Lyft pick-up and drop-off areas on-site. Go a step further and make a small donation to Trees, Water, & People as a carbon offset when you purchase your ticket. If you’re attending one of our 108s, keep an eye out for a booth featuring a local environmental organization, or a local chapter of a national org. We’re offering one complimentary spot at every 108 site for such a group, in order to promote education and involvement. You can also participate in on-site activations where applicable—at Wanderlust O’ahu, each year, for example, we partner with Sustainable Coastlines for a beach clean-up on the North Shore. Learn more about carbon offsets! Purchase a kit to commit long-term! Ready to be a beacon of environmental stewardship and wander without waste through your everyday life? Take home a Wander Without Waste kit, available for purchase at the adidas x Wanderlust Store at any of our summer festivals. The kit includes reusable bamboo utensils, a Kleen Kanteen Tumblr, and a Kleen Kanteen Thermos—all in a super cute tote bag. We’re proud also to provide all of our staff and event talent with a kit, so we’re truly walking the walk: How can we ask others to participate if we’re not committed to making big changes internally as well? Heads up: NO PLASTIC WATER BOTTLES will be available for purchase at any of our events going forward. Be sure to pack your own bottle, or you can purchase one on-site. Water filling stations are available at all events in the US and Canada. We’re betting that our attendees think it’s just simply important as well. There’s nothing too complicated about right decisions.